"I consider From Solidarity to Martial Law a highly successful effort at depicting the events of 25 years ago. These documents ... enable us to perceive the path we have traversed since that time when, prior to Gorbachev and prior to Reagan, we created the first fissure in the system of communist captivity." "An important and very revealing contribution to a better understanding of a particularly critical phase in the Cold War. The documents [in this book] provide a sense of intimacy to the complex interactions between American and Soviet decision makers as well as an insight into the internal Communist debates." Washington D.C., December 11, 2006 - Twenty-five years ago this week, at 6:00 a.m. on December 13, 1981, Polish Prime Minister Wojciech Jaruzelski appeared on national TV to declare that a state of martial law existed in the country. Earlier in the night, military and police forces had begun securing strategic facilities while ZOMO special police rounded up thousands of members of the Solidarity trade union, including its celebrated leader, Lech Walesa. 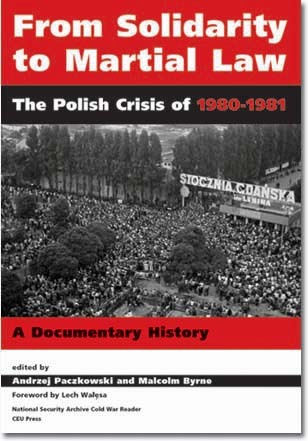 A quarter-century later, the George Washington University-based National Security Archive is publishing, through Central European University Press a collection of previously secret documentation entitled From Solidarity to Martial Law, edited by Andrzej Paczkowski and Malcolm Byrne (Walesa provided the volume's foreword). The documents, many of which have never been published in English, are from inside Solidarity, the Polish communist party leadership, the Kremlin as well as the White House and CIA. They provide a vivid history of the Solidarity period, one of the most dramatic episodes in the Cold War. While martial law was highly effective in suppressing the union and restoring communist party control in Poland, the authorities could not eradicate the political movement that had been awakened, and that Solidarity both led and symbolized. In 1983, Walesa would win the Nobel Peace Prize and before the end of the decade, Poles would elect Eastern Europe's first non-communist government since World War II. Although a crackdown of some kind against the union had long been feared and anticipated (ever since Solidarity's founding in August 1980), when it came it nonetheless took most observers outside of Poland by surprise. For over a year, Jaruzelski's patrons in the Kremlin had been applying extraordinary political pressure on Warsaw to crush the opposition, but Jaruzelski did not inform them that he was finally ready to act until approximately two days before. In the United States, observers and policy-makers were also caught off-guard despite having had a highly-placed spy in the Polish Defense Ministry until just weeks before the crackdown. Part of the explanation was that senior officials focused on the possibility of a Soviet invasion, not an internal "solution." An invasion, especially after the Red Army's move into Afghanistan two years earlier, would have created a major international crisis. But U.S. officials also misread the Polish leadership, including Jaruzelski, documents show. In evaluating the possibility of an outside invasion earlier in 1981, State Department and CIA analyses concluded that even the Polish communist party would resist a Soviet move, along with the rest of the population, and would use martial law as a way to "maximize deterrence" against Moscow. In fact, internal Polish and Soviet records make clear that Jaruzelski and his colleagues were intent on imposing military rule for purposes of reasserting control over society, a goal they fully shared with the Kremlin. The new book contains 95 documents in translation, representing sources from the archives of eight countries, and thus providing a multi-dimensional, multi-national perspective on the key aspects of the Solidarity crisis. The documents are accompanied by descriptive "headnotes" explaining the significance of each item, along with a lengthy chronology of events and other research aids. A major overview by the editors describes and locates the events in their historical context.